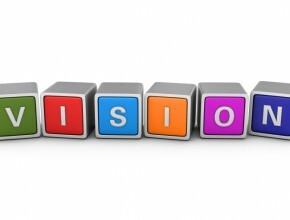 A vision statement is a declaration of where you are headed – your future state. In writing your vision statement, formulate a picture of what your organization’s future makeup will be and where the organization is headed. We always explain your vision as “knowing what mountain you’re climbing,” and your mission as “what you are here to do.” Your vision is the ambitious future Point B to your current Point A. Truly great companies understand the difference between what should never change and what should be open for change, between what is genuinely sacred and what is not. This rare ability to manage continuity and change is closely linked to the ability to develop a vision. A vision statement must be directional – pointing you and your team towards a place you aspire to be. For this to happen, the direction needs to be as clear as possible. Sometimes a picture really is worth a thousand words. As you are working through this exercise, challenge yourself – is your vision fuzzy like a Monet? Or is it precise and crisp like a Norman Rockwell? Casting a clear vision tells your employees where they’ll be if they stick around. If you want to craft a powerful vision, first ask, what will your organization look like 5 to 10 years from now? What does success look like? What are we aspiring to achieve? While guiding this section of your strategy, find the healthy tension between aspirational and magical thinking. You want a statement that inspires and motivates, but that is also based in reality. Practice the art of brevity in order to craft your future direction in a sentence or two, which helps communicate your vision far and wide. Use the “Vision Description” as a place for verbosity to paint with Norman Rockwell clarity. To learn more, watch How To Write a Vision Statement.